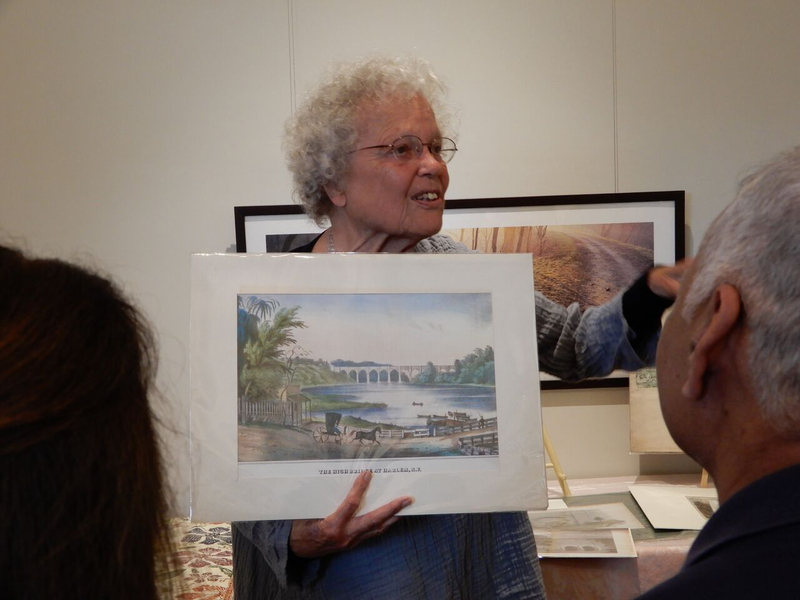 On Sunday afternoon, June 3rd, Cornelia Cotton, long time member of the Friends shared with a standing room only audience her own perspective of the story of the Old Croton Aqueduct. Cornelia grew up in Germany in a family of artists and musicians. Her father, a violinist, played in a string quartet with the great painter, Paul Klee, an excellent musician. When Cornelia immigrated to the U.S., she brought her love of the arts with her, which she shared with her husband, Bill Cotton. After the couple settled in Croton, they raised three daughters and built their house, which they designed themselves and built with their own hands. When Cornelia opened her gallery in Croton, she hoped to combine her love of history and art in her shows. After discovering the Old Croton Aqueduct, she began to collect and exhibit old prints, maps, and other material of the OCA. She became enthusiastic about the engineering genius of this 19th century marvel as well of the beauty and dignity of its design. It has become a favorite subject of research and of her talks to historical groups in Westchester. The audience on Sunday loved her warm delivery and came away with a new understanding of why so many river town residents love the Old Croton Aqueduct.